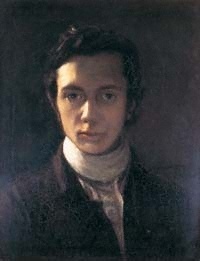 William Hazlitt was a famous Critic from England, who lived between April 10, 1778 and September 18, 1830. He became 52 years old. He was an English novelist, essayist and literary critic. He collaborated with such newspapers as the Morning Chronicle, the Edinburgh Review, The London Magazine and The Times, published a series of essays, including figures of the arts dedicated to William Shakespeare. His most famous work is published in 1825, The Spirit of the Age, in which he described the contemporary artists, such as Lord Byron, Jeremy Bentham, Walter Scott. Our collection contains 93 quotes who is written / told by William, under the main topics: Words of Wisdom, Travel. "An honest man speaks the truth, though it may give offence; a vain man, in order that it may"
"Do not keep on with a mockery of friendship after the substance is gone - but part, while you can part friends. Bury the carcass of friendship: it is not worth embalming"
"The most learned are often the most narrow minded"
"The perfect joys of heaven do not satisfy the cravings of nature"
"The person whose doors I enter with most pleasure, and quit with most regret, never did me the smallest favor"
"The player envies only the player, the poet envies only the poet"
"Those who can command themselves command others"
"A gentle word, a kind look, a good-natured smile can work wonders and accomplish miracles"
"A grave blockhead should always go about with a lively one - they show one another off to the best advantage"
"A scholar is like a book written in a dead language. It is not every one that can read in it"
"Good temper is one of the greatest preservers of the features"
"Grace in women has more effect than beauty"
"Grace is the absence of everything that indicates pain or difficulty, hesitation or incongruity"
"If the world were good for nothing else, it is a fine subject for speculation"
"Life is the art of being well deceived; and in order that the deception may succeed it must be habitual and uninterrupted"
"The humblest painter is a true scholar; and the best of scholars the scholar of nature"
"The most insignificant people are the most apt to sneer at others. They are safe from reprisals. And have no hope of rising in their own self esteem but by lowering their neighbors"
"The true barbarian is he who thinks everything barbarous but his own tastes and prejudices"
"Those who are at war with others are not at peace with themselves"
"Those who make their dress a principal part of themselves, will, in general, become of no more value than their dress"
"To a superior race of being the pretensions of mankind to extraordinary sanctity and virtue must seem... ridiculous"
"To be happy, we must be true to nature and carry our age along with us"
"When a thing ceases to be a subject of controversy, it ceases to be a subject of interest"
"Wit is the salt of conversation, not the food"
"Almost every sect of Christianity is a perversion of its essence, to accommodate it to the prejudices of the world"
"Dandyism is a variety of genius"
"Few things tend more to alienate friendship than a want of punctuality in our engagements. I have known the breach of a promise to dine or sup to break up more than one intimacy"
"Man is the only animal that laughs and weeps; for he is the only animal that is struck with the difference between what things are, and what they ought to be"
"One shining quality lends a lustre to another, or hides some glaring defect"
"Rules and models destroy genius and art"
"The art of pleasing consists in being pleased"
"The only vice that cannot be forgiven is hypocrisy. The repentance of a hypocrite is itself hypocrisy"
"The soul of a journey is liberty, perfect liberty, to think, feel, do just as one pleases"
"To be remembered after we are dead, is but poor recompense for being treated with contempt while we are living"
"Anyone who has passed though the regular gradations of a classical education, and is not made a fool by it, may consider himself as having had a very narrow escape"
"Cunning is the art of concealing our own defects, and discovering other people's weaknesses"
"Dr. Johnson was a lazy learned man who liked to think and talk better than to read or write; who, however, wrote much and well, but too often by rote"
"Love turns, with a little indulgence, to indifference or disgust; hatred alone is immortal"
"Prejudice is the child of ignorance"
"To think ill of mankind and not wish ill to them, is perhaps the highest wisdom and virtue"
"We often choose a friend as we do a mistress - for no particular excellence in themselves, but merely from some circumstance that flatters our self-love"
"Without the aid of prejudice and custom, I should not be able to find my way across the room"
"Zeal will do more than knowledge"
"As is our confidence, so is our capacity"
"Envy among other ingredients has a mixture of the love of justice in it. We are more angry at undeserved than at deserved good-fortune"
"Gracefulness has been defined to be the outward expression of the inward harmony of the soul"
"It is hard for any one to be an honest politician who is not born and bred a Dissenter"
"Look up, laugh loud, talk big, keep the color in your cheek and the fire in your eye, adorn your person, maintain your health, your beauty and your animal spirits"
"Satirists gain the applause of others through fear, not through love"
"The seat of knowledge is in the head; of wisdom, in the heart. We are sure to judge wrong, if we do not feel right"
"The smallest pain in our little finger gives us more concern than the destruction of millions of our fellow beings"
"There is no one thoroughly despicable. We cannot descend much lower than an idiot; and an idiot has some advantages over a wise man"
"There is nothing good to be had in the country, or if there is, they will not let you have it"
"Defoe says that there were a hundred thousand country fellows in his time ready to fight to the death against popery, without knowing whether popery was a man or a horse"
"Genius, like humanity, rusts for want of use"
"Grace has been defined as the outward expression of the inward harmony of the soul"
"If you think you can win, you can win. Faith is necessary to victory"
"Some people break promises for the pleasure of breaking them"
"That which is not, shall never be; that which is, shall never cease to be. To the wise, these truths are self-evident"
"The public have neither shame or gratitude"
"The way to get on in the world is to be neither more nor less wise, neither better nor worse than your neighbours"
"Those who speak ill of the spiritual life, although they come and go by day, are like the smith's bellows: they take breath but are not alive"
"To be capable of steady friendship or lasting love, are the two greatest proofs, not only of goodness of heart, but of strength of mind"
"To get others to come into our ways of thinking, we must go over to theirs; and it is necessary to follow, in order to lead"
"We never do anything well till we cease to think about the manner of doing it"
"It is not fit that every man should travel; it makes a wise man better, and a fool worse"
"You know more of a road by having traveled it than by all the conjectures and descriptions in the world"
"A hypocrite despises those whom he deceives, but has no respect for himself. He would make a dupe of himself too, if he could"
"A nickname is the heaviest stone that the devil can throw at a man. It is a bugbear to the imagination, and, though we do not believe in it, it still haunts our apprehensions"
"It is better to be able neither to read nor write than to be able to do nothing else"
"Some one is generally sure to be the sufferer by a joke"
"The art of life is to know how to enjoy a little and to endure very much"